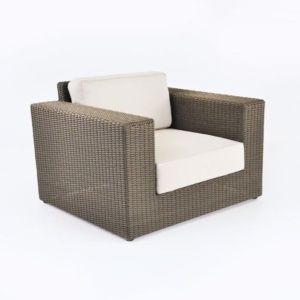 Start the process of configuring your space with the Austin Wicker Outdoor Sectional Left Arm Chair in Kubu. 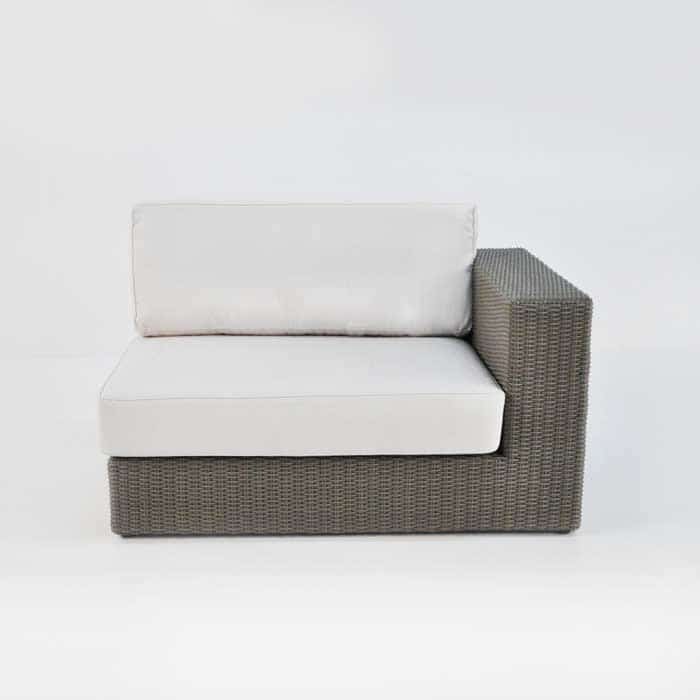 Complete with strong lines, a chunky frame, and soft Sunbrella® cushions; the Austin Wicker Outdoor Sectional Left Arm Chair in Kubu is a fantastic singular piece or as part of a bigger picture. Design Warehouse’s Austin Collection boasts many different pieces so that you may create different shapes to cater to the size of your space. Choose from sectional pieces: Corner, Centre, Right arm and Left arm as well as 1, 2 and 3 Seater Sofa and Chairs! The Austin’s wide arm is also perfect for resting drinks on, so that you don’t necessarily need an accent or side table. 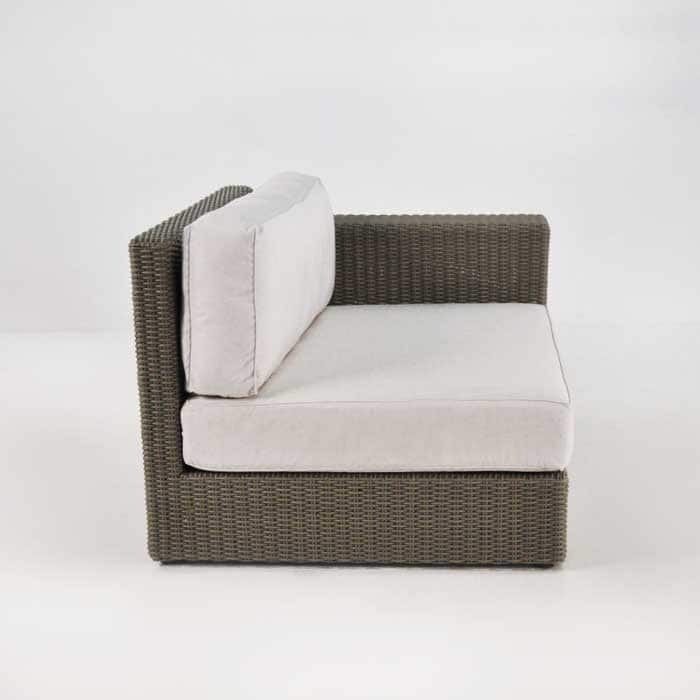 Our Austin Wicker Outdoor Sectional Left Arm Chair in Kubu is constructed out of a fine blend of polyethylene synthetic fabric on a powder coated aluminium frame. 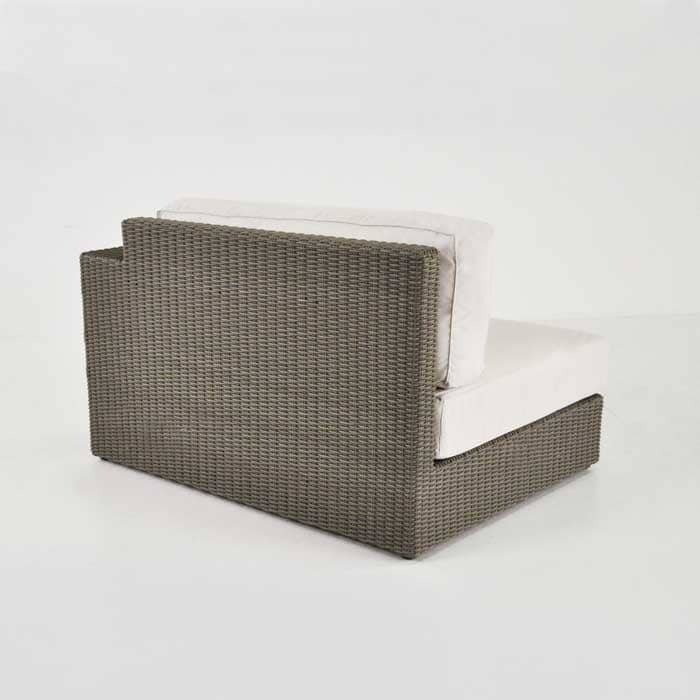 Viro® wicker, is our front running brand of All Weather Wicker. Being UV treated and through dyed, the wicker has been made to look and feel luxurious while still being resistant to harsh weather conditions. Each of these magnificent chairs are dressed with Sunbrella® cushions, available in either Taupe or Canvas colours. This is a fabric that is worldwide recognised for quality, longevity and being extremely attractive. If you love deep seating but are more interested in a different material, we have plenty to choose from! 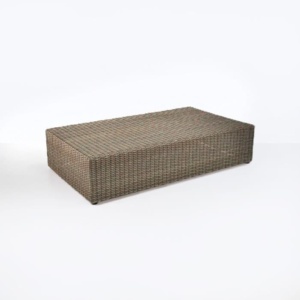 A vast selection of Grade A teak and All Weather Wicker make up the contingent of our deep seating, while tables, chairs, loungers, brollys, relaxing chairs and planters are available in these materials, as well as Batyline® mesh, Stainless Steel, Reclaimed Teak and Raw Concrete. Design Warehouse has been in business for over 20 years, this is because of our commitment to bringing luxurious furniture to our customers at wholesale prices. We are available from 10am every day. Pop into our store or call us! One of our sales assistants will be happy to help discover the next stage for your space. 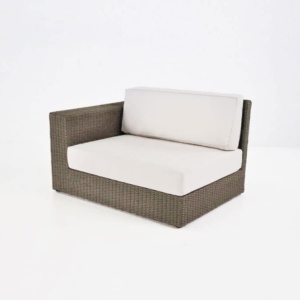 The Austin Wicker Outdoor Sectional Left Arm Chair in Kubu can be matched with an adjoining Right Arm Chair for a customized length of your sofa! Make it longer with the addition of one or two Centre pieces – you can make it as long or short as your space allows! Located under each individual piece are clips to secure your Austin Sectional together. Perhaps you want a perfect ‘L’ shape for the corner of your courtyard. 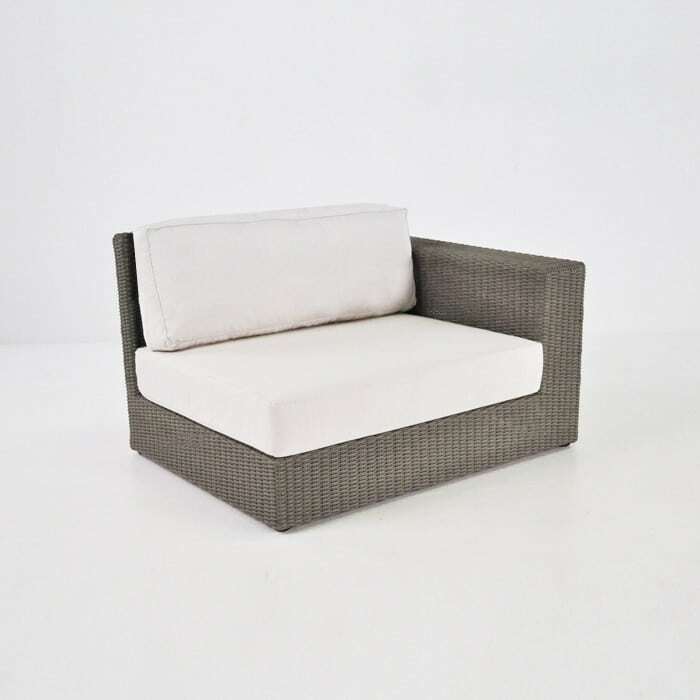 Start with a Corner piece, add a centre or two to each side and place a Austin Wicker Outdoor Sectional Left Arm Chair in Kubu on the Left and a mirroring Right Arm Chair opposite. Place one of our Austin tables in the midst for a beautifully pulled together look. Dress with candles, and surround with plants and you will have created a complete look is welcoming and grand, perfect for hosting parties or casual dinners for friends. Includes FREE Sunbrella® cushions as shown. 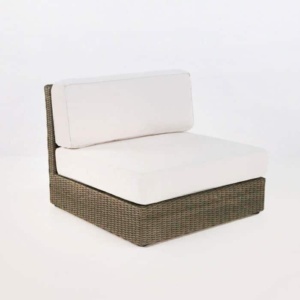 The Austin Wicker Outdoor Sectional Collection is available in Antique Java and Kubu wicker colours. 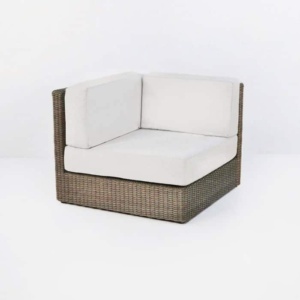 The Austin Wicker Outdoor Sectional Left Arm Chair in Kubu is the beginning of something great. Employ that greatness in your space.